HDP and CHP flags wave side by side during a rally of CHP's presidential candidate Muharrem İnce in the southeastern province of Diyarbakır, June 13, 2018. The pro-PKK Peoples' Democratic Party (HDP) has stepped up its cooperation with the main opposition Republican People's Party (CHP) for the March 31 local elections, although the administrations of both parties have been denied forming an alliance. With contradicting statements refuting the alliance between the two parties, the HDP's co-head in İzmir province, Kadir Bayur, announced yesterday that they decided not to nominate a candidate in İzmir because the HDP will support CHP's candidate, Tunç Soyer, "whose profile best fits HDP's profile for the city." "If our voter base asks us whom to vote for, we will point to Tunç Soyer," Baydur said, adding that the party will decide in the upcoming days whether to nominate candidates for İzmir district municipalities or not. The HDP announced previously that it will not nominate mayoral candidates in seven major municipalities, including Istanbul, İzmir and Ankara, in the March 31 local elections. The decision raised questions about a possible secret alliance between the CHP and HDP, despite both parties refuting the claims of the alliance. HDP's declaration of not nominating candidates in certain provinces has angered many party members within the Nation Alliance formed by the CHP and the far-right Good Party (İP). Some party members of the İP even resigned from their parties and joined the ranks of the ruling Justice and Development Party (AK Party) in protest of their party's administration. In a bid to appease its party's organization in the face of the developments, İP Chairwoman Meral Akşener previously announced that her party will not present candidates in northeastern Iğdır province and Ahlat district, where HDP's voter base is strong, and advised other parties to do the same in order to prevent the HDP from taking over the municipalities. Commenting on Akşener's decision, HDP Co-chairman Sezai Temelli yesterday said the party will field candidates in the election districts left to the İP as a part of the Nation Alliance talks as retaliation. He underscored that they are having difficulty understanding this decision because an opposition party should oppose the ruling party, not oppose another opposition party. Meanwhile, Akif Hamza Çelebi the CHP's secretary-general also handed in his resignation yesterday. The HDP has long been accused of being a political wing of the PKK. In September 2018, former HDP Chairman Selahattin Demirtaş was sentenced to four years and eight months in prison for spreading terrorist propaganda. Demirtaş has been in prison since 2016 on terrorism-related charges. Most recently, Mardin Public Prosecutor's Office launched an investigation yesterday into 16 suspects with the charges of spreading terrorist propaganda in a candidate presentation meeting in the province. In relation to the secret cooperation between the CHP and the HDP, CHP Deputy Chairman Seyit Torun said yesterday in a press briefing that they are in an alliance with only the İP and not cooperating officially or secretly with another party. However, he added the CHP would welcome any party that would contribute to the alliance's electoral base. The partnership between the two opposition parties became more visible during the previous general elections on June 24. 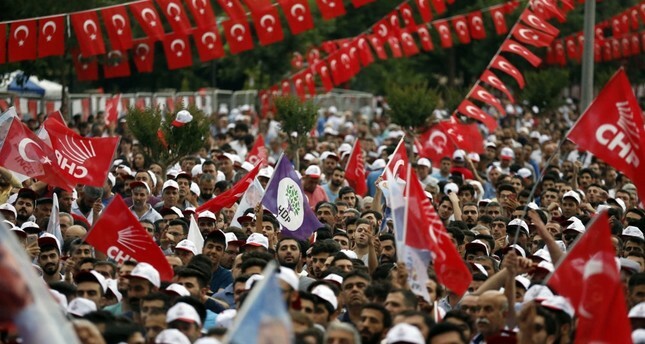 One of the most memorable incidents of that election period was CHP's presidential candidate Muharrem İnce's rally in southeastern Diyarbakır province, which is one of the provinces that the HDP has a remarkable voter base, since the rally witnessed the waving of CHP and HDP flags side by side by both parties' supporters. The CHP has refrained from officially including the HDP in its electoral alliance with the İP amid fears of a possible backlash from its secular-nationalist voter base. In the June 24, 2018, general elections, however, the CHP had urged its voter base to vote for the HDP to stop the AK Party from having a single majority - a possibility had the HDP not passed the 10 percent threshold and failed to win Parliament seats. The Nation Alliance between the CHP, the İP, the Felicity Party (SP) and the center-right Democrat Party (DP) received 33.9 percent of the votes in the June 24 parliamentary elections. It suffered a defeat at the hands of the People's Alliance between the AK Party and the Nationalist Movement Party (MHP), which received 53.7 percent of the votes. Torun also disclosed their election manifesto, titled "Democrat Municipality for Cohabiting Peacefully." He underscored that CHP's election manifesto will mainly focus on the party's understanding of local governing, local economic development policy, and city and environment policies. "On Feb. 10, we will be holding a CHP candidate presentation meeting in Ankara. We will officially launch our election campaign and begun our fieldwork. The details of the election manifesto will be announced by party Chairman Kemal Kılıçdaroğlu," he said. The 35-page election manifesto will redefine municipalities as more service-focused intuitions which prioritize women and children under the framework of a "sustainable and institutional municipality." Accordingly, CHP's municipalities will strive to respond to local economic problems by adopting measures to reduce the cost of the daily lives of people. Another focal point of the manifesto will be increasing green zones in the district and carving out measures to prevent rapid concretion of cities. Torun also announced 16 more district mayoral candidates for the upcoming March 31 elections. Celal Çevik, Kılıçdaroğlu's lawyer, was nominated as the Etimesgut district mayoral candidate in Ankara, while the current heads of the party in Istanbul's Maltepe, Ali Kılıç, and Silivri, Özcan Işıklar, were presented as district mayor candidates in their respective districts.